Do you like adventure? 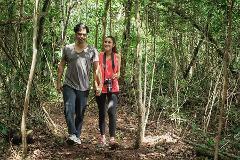 Hop on one of our Polaris ATVs to enjoy this fun 10.5 km jaunt through the jungle. Climb our 20-meter Scenic Tower and cruise a magical tree-lined trail to Dakini Lagoon, full of water lilies and lotuses. 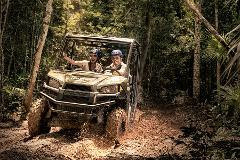 Drive our Polaris ATVs over 4.6 kilometers of Mayan jungle for an adrenaline-filled adventure. Trek over tree trunks, puddles and rocks, then climb tall slopes. Hike two trails. Climb our 20-meter tower. This is a bird-watching tour, in which visitors hike along our Bird-Watching Trail and then climb 20 meters up our Scenic Tower. There they can spot the great diversity of the feathered species that dwell in the majestic beauty of Jungle. 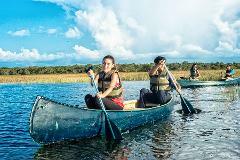 Our Museo de los Senderos (Museum of the Trails) will immerse you in seven different experiences, combining nature and culture as you learn about jungle plant and wildlife. You will also climb our 20-foot high Scenic Tower.